Our 6 mil clear lay flat plastic bags on rolls are made in the USA of 100% virgin Low Density Polyethylene (LDPE) resin that meets FDA/USDA specifications. They contain 15% metallocene for added strength. Easy dispensing with perforations between bags. Tubular construction with a durable double bottom seal makes these the best on the market. This premium bag features superior clarity for showing the quality of your product. Neatly wound on a 3″ core with 1″ diameter core plug. 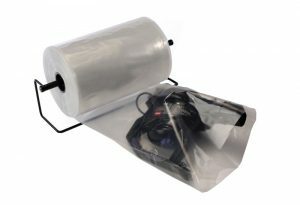 Can be heat sealed, tied, stapled or taped shut.